Your gutters must be aligned properly in order to ensure proper draining. 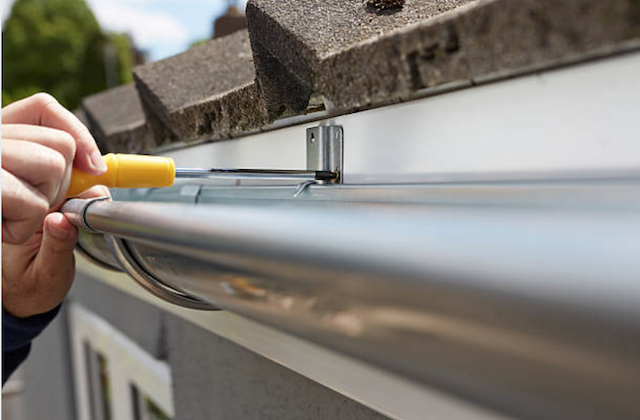 Below is a guide on how to realign gutters. If this is a job you are not comfortable completing, please consider calling WE CLEAN GUTTERS LLC for our gutter repair service. We will inspect and realign the gutters on your home. Your gutter needs to be in proper condition to perform its role. Sometimes weather conditions and elements such as too much water, wind and debris might push a gutter out of its correct position. When this happens, you need to rectify the situation as soon as possible because the consequences will be unpleasant if you don’t. The rainwater will pool on your roof, garage or other places in the house and it will damage your home. You need to know where the problem lies before you start fixing anything. The only way you can do this is by inspecting the gutter. You should look out for debris build up, blockages or leaks or broken seals. Knowing any other problems that a gutter has is part of maintenance because you will then fix these issues. If there is a section of the gutter that is bent, then this is the place that needs realignment. You can pour water from the far end of the downspout and watch its speeds as it goes through the gutter. If the water changes its speed at some point, you need to check out that spot because it may have a problem. If the water backs up at the spot, then it might be due to debris build-up which might prevent the water from going through. However, if the water slows down, then the slope might be bent, and this might be the reason that water does not flow smoothly through the gutter. Once you know what the problem is, the next step is fixing it. If your gutter has debris, maybe from fallen leaves, twigs and soil, you should remove them. Installing a mesh guard is a great idea for trapping debris to prevent it from accumulating in the gutter. If the gutter is bent at some point, then you need to start the realignment process. There are various ways you can realign a gutter. The gutter might be slightly out of shape or may be sagging. If this is the case, then you can use pressure to bring it back to its original shape. Focus on the problem area, and this is the spot where water is not moving smoothly. If the brackets that are directly in front of the problem area or behind it are loose or broken, then it means that they’re not properly aligned. Therefore, you need to tighten the loose brackets or replace the loose ones. After that, you should pour water into the gutter as you did previously and checked how the water flows. You should pay attention to the areas you just fixed to see if it worked. Research suggests that sectional gutters tend to sag compared to seamless gutters. Wind, ide and too much debris can make the seams to fail. If some sections of the gutter are broken, you will need to replace them. If you are only changing a part of the gutter, then you’ll remove the screws or nails that hold it together. You can then take out the damaged piece and replace it with a new one. If a nail and spike installation was used on the gutter, then you will have to use needle nose pliers to remove the spike. This type of installation is a bit complex. You cannot simply put a new piece in the damaged section. After putting in the new part, you will have to reinstall the entire system. It is possible to realign gutters yourself. However, there are cases where it is best to call a gutter company to come to fix the problem for you. If you cannot determine the problem or are unable to realign the gutter, then please call WE CLEAN GUTTERS LLC. You will save yourself a headache and some time. Information on our service area.